There is general consensus that the earthly ministry of Jesus lasted about three years. How is that determined? One primary source is the Gospel of John, with its inclusion of feasts. 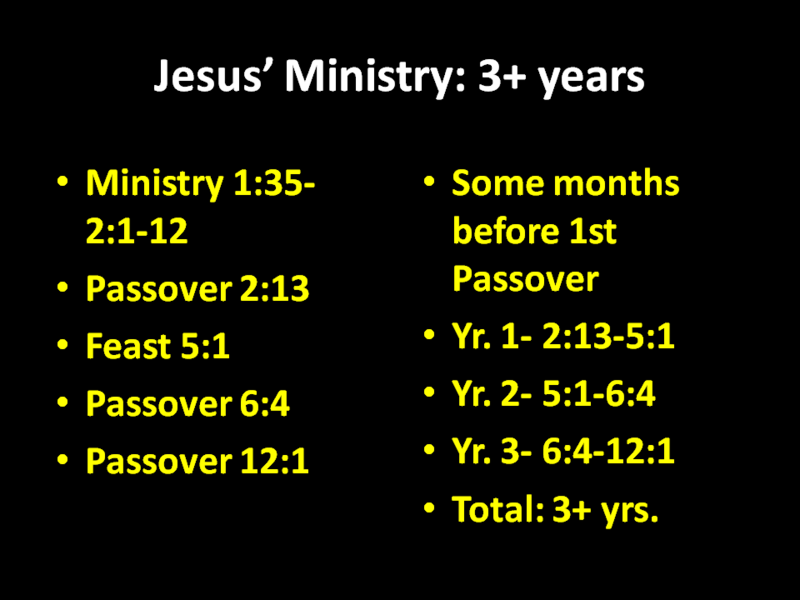 Jesus' 3+ Yr. Ministry. Chart by Leon Mauldin. The word for feast (ἑορτή, heortē) was without the definite article in nearly all the earliest Greek manuscripts and versions. If the definite article had been read, then there would have been strong grounds for understanding this festival as a Passover, or possibly as Tabernacles, which was often referred to as “the Feast” (ההג, hahag) (College Press NIV Commentary). This week I have enjoyed the opportunity to present 6 lessons in our local county (Cullman) at the Prospect church of Christ. Kent Persall is the evangelist there. 40+ years ago Kent, his wife Diane and I were students at Florida College. This entry was posted on Friday, November 11th, 2011 at 8:33 AM and is filed under Bible Study, Israel, New Testament. You can follow any responses to this entry through the RSS 2.0 feed. You can leave a response, or trackback from your own site.